10 Bedroom House For Sale in Callander for Offers Over £475,000. Winner Of Four In A Bed ! The Highland Guest House is run under the personal supervision of the resident owners - Angela & Tom Jones - who assure all visitors and guests a warm and friendly welcome. Highland Guest House is an extremely profitable business with detailed accounts available on request through the office. Open all year, this neat Georgian Town House built around 1790 is full of charm and character and retaining some of its original features. There is also a 3 bedroom lodge providing self contained living accommodation. 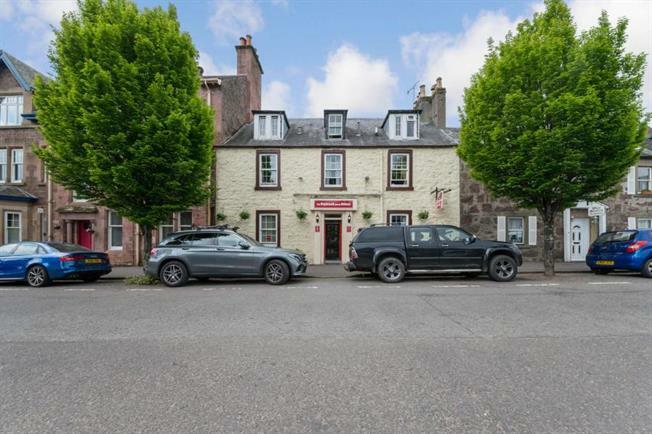 The property is situated in the centre of Callander in the heart of the Trossachs now forming part of Scotland's first national park. The property is quietly situated just off the main street. A short walk will bring you to the river Teith, shops and the Visit Scotland and Trossachs visitor centre, a must for those interested in the daring exploits of the Highland rogue. The meadows and Crags overlooking the town provide ideal walks, cycle routes and picnic facilities, a perfect base for outdoor activities, golf, fishing, walking and cycling. Callander being the gateway to the Highlands is one hours easy drive from both Edinburgh and Glasgow airports. There are ten well appointed individually decorated and furnished bedrooms. Each benefits from en-suite bath or shower rooms, colour television, clock-radio, hospitality trays, and full central heating. The residents lounge complete with colour television offers a welcoming and homely atmosphere where guests have an opportunity to relax in warm and comfortable surroundings and is available for use all day. The cosy intimate bar operates with a residents license and is open to residents and their guests only. The bar boasts many brands of Malt Whisky, a selection of bottled beers, spirits and various wines.